However, recent postings by brocky41 of both datsun.co.nz and oldschool.co.nz fame, have brought forth video of a certain KHGC110 that races in the North Island. I’d seen the car on trademe initially, a few years back, just as a road car. Subsequently I saw a few pictures of it via Snoozin who helps out at the Manfeild track, marshalling and such, given him the perfect place to take photographs. However, as nice (though somewhat plain) as it looked in photographs, seeing and hearing it in motion via brocky41‘s video postings, is a different sensation entirely. So I thought that seeing as I’m on a bit of a C110 mission with my own at the moment, I’d use it as further inspiration as well as share it with you. So enjoy the few video’s and pictures that I do have and if you live in the NI, go see it race and commend the chap on his choice of car. Click the ‘More>>’ for .. well, more pictures and the video. 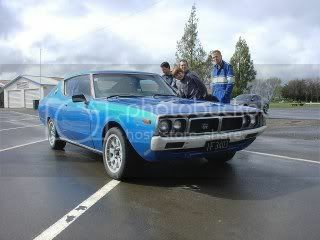 Those that check here frequently will notice the post before this one (by Orion) that shows an S21 Prince Skyline Super, on trademe.co.nz. It’s in worse, though more complete condition than mine. The interesting part however is that it’s the very same one that I was made aware of by Ed (RatDat) and subsequently made mention of in this entry here. I got the number of where it was but never got around to making contact. Now that it’s come up and the chap is after $12000NZD, I’m quite glad I didn’t get around to ringing the guy. A bit ridiculous if you ask me, especially if you take into consideration that there was a Prince Skyway (the wagon version) recently for sale on trademe, for less and in better condition. Ah well, it takes all types. HOWEVER! If you’re interested in a Prince Skyline. Then that’s not the one you want. You want THIS one! Holy hell, is this guy 4realz? 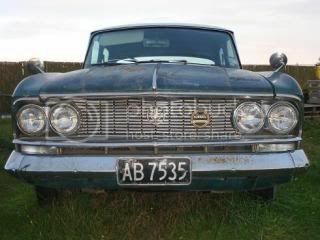 spotted on Trademe: one 1962 S21 Skyline Super (much like Michael’s one, except in somewhat tattier condition)… dead engine, dead rego, rust for Africa, and all for $12,000? Daaaaaaamn. Would they even be worth this much in restored condition? Check out the other cars in the background too! suit restore. Captain kyteler, I suggests thou gets busy on thine! Cortinas; the best ones are a Nightmare. Having not stumbled through the projects on retro-rides.org for a while I decided to do so today, in aid of finding something worth of biffing up on here for everyone to admire in all it’s greatness. As is usually the case with RR, to find such an example did not take long at all. There’s was in fact something on the very first page that caught my eye. A collection of letters inside some brackets on a NightmaresRacing thread that spelt out “ITS ALIVE 25/4/09″… …well, anyone who frequents RR will know that anytime Nightmares does something, it’s done to an amazing quality and in a short space of time. I’ll let you wander around the thread itself but here’s a sneak preview of what is the product of a seriously amazing craftsman. So, as was expected, my second package from Japan arrived (actually it arrived yesterday but let’s not be picky, I posted this entry a day late) in the same 3-day time frame that the first one took. 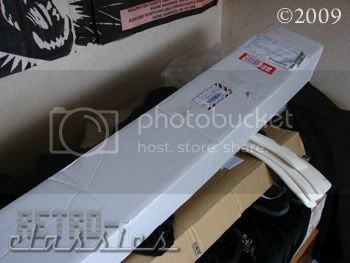 Though this time I was at home to receive it, at 11:20am. Even the Courier was surprised it had arrived in 3 days and said himself that it was faster than internal New Zealand freight, I agreed. So… what came this time around? WELL! Let’s see! Oooh, what could it be? It's fairly long or is that wide?